now i want to build from that a useful project. - you know why Thailand is such a romantic country? minimum once a week we sit at candle light because the electric power fails. as my load, the LED light, will be low power the charging unit will be strong enough to run the LEDs and load the battery. 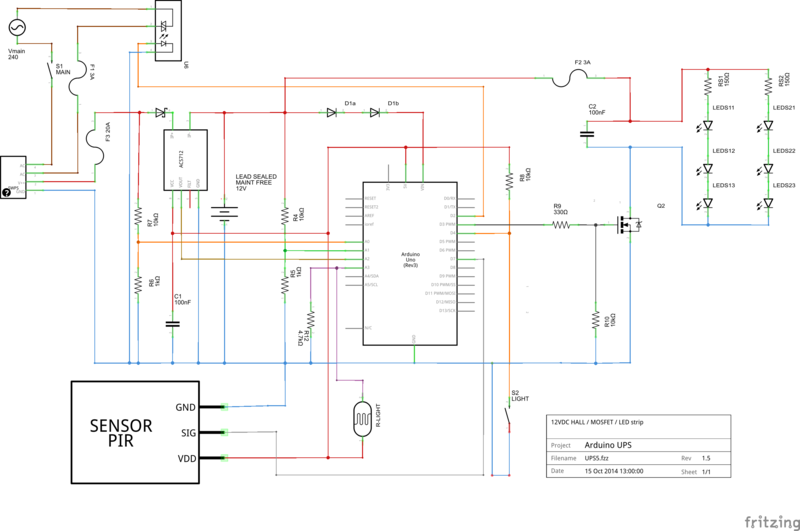 what i want to build could be called a ONLINE / FULL UPS, compared to the PC UPS what have a very small battery loading circuit, a bypass switch and a inverter from battery to 220VAC with the Watt spec. of the UPS, called offline/standby UPS . Any lead-acid battery system when overcharged (>14.34 V) will produce hydrogen gas (gassing voltage) by electrolysis of water. 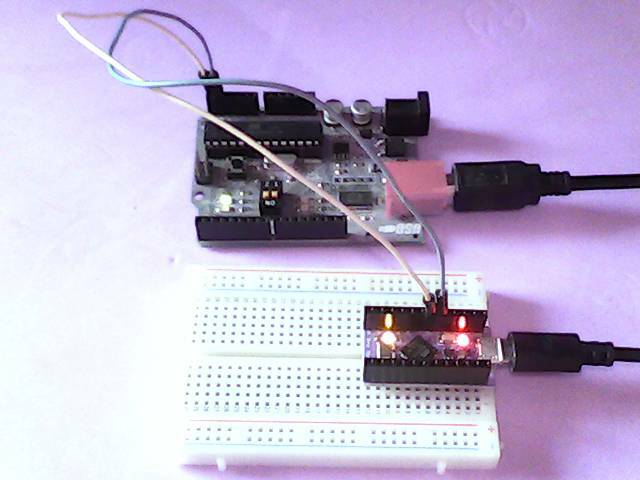 a MOSFET as ON OFF switch and a HALL sensor to know the current, the voltages can be monitored by voltage divider to Arduino Ains. Instead of adjusting the loading Voltage ( energy inefficient ) i could with this adjust the current average by PWM. And a Fuse would be good?? not easy to find for DC, ok car shop! 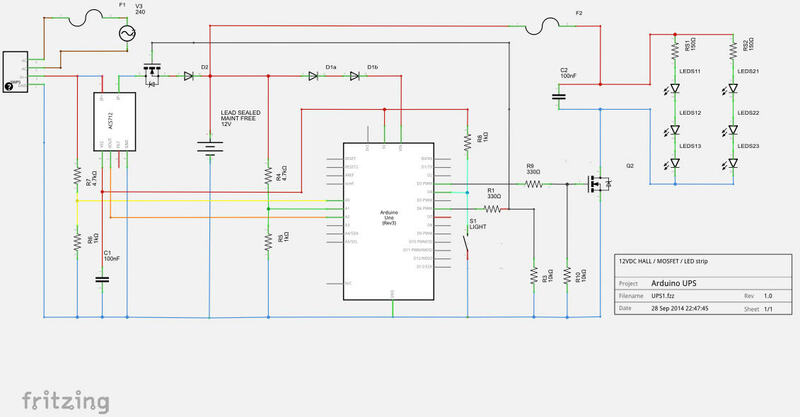 _+_ a smaller MOSFET to switch on 12V LED, feed from PS or Battery ?PWM? _+_ battery protection by switch of light in case of very low battery? 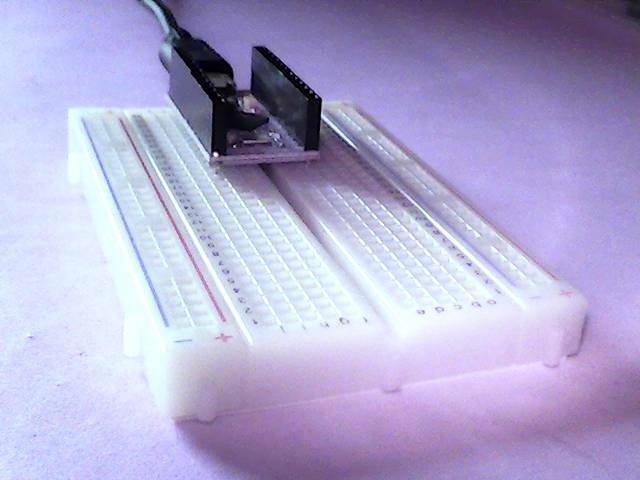 _+_ or a PIR movement sensor could switch on the light even without push buttons. first have to read more about it, possibly test my opto circuit from last time, if it works on high side, or get a H Bridge Driver IC..., and as i only have n MOSFET for test, why not switch the minus side of the battery, as in England they wire the cars? for energy reasons possibly it would be best to switch the AC to the SWPS . the old battery shows 12.8V ( its fully charged? 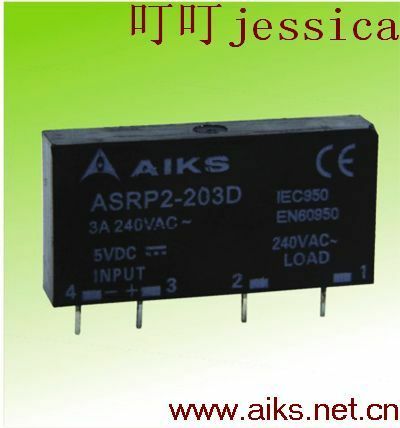 ), the 20A SWPS is adjustable only 10.3 .. 13.7 VDC, and loads with max 0.5A decreasing. Again i am far from testing high Amps, but for this idea it could be usable, i hope a low ohm MOSFET still allow a loading current. But there is no "room" for a diode and that is a problem, when the powersupply is OFF there is a current of -70mA from the battery back into the SWPS ? there in should be one rectifier DIODE?? possibly i can use a Schottky Diode. today at the electronic shop i not get much, but first i found that so called HELPING HAND, for 180THB. now possibly get some soldering done. but when i search for the datasheet i only ended up at a very interesting report about the damage at the japanese Fukushima Dai-ichi Nuclear Power Station. but without a switch for the Battery also no PWM current control possible. first test with the SSR show that R13 330ohm is not needed, it seems to be integrated, at Dout directly connected now have 11mA to GND. 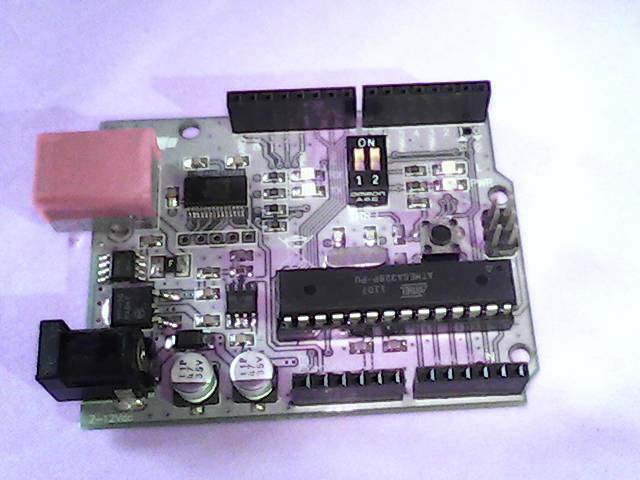 or use the Duemilanove board without/removed CPU as FTDI board. 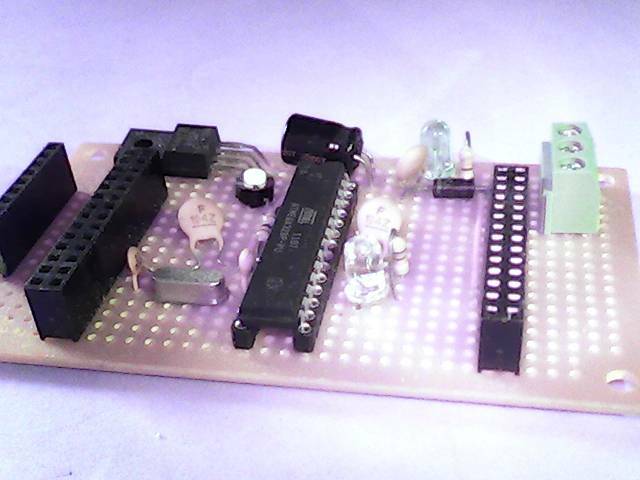 And the new Arduino MICRO board, where i not used the solder pins ( what i find in the pack ), use the expensive arduino shield headers, so even without using a breadboard i can use jumpercables for a quick connect. 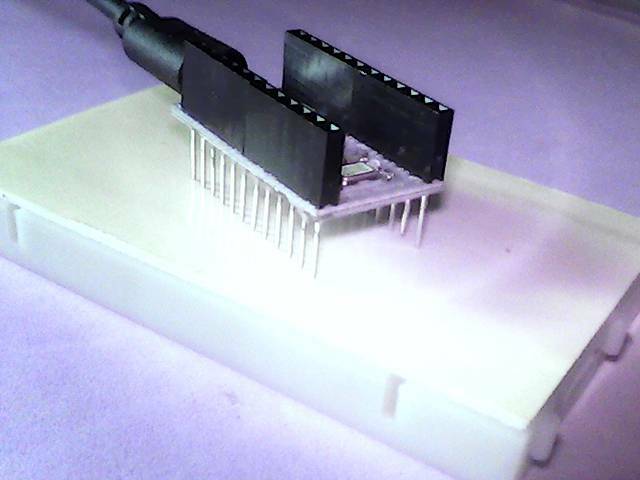 Here now only used for the I2C debug from the DIY duino ( code: kllwireslave ). 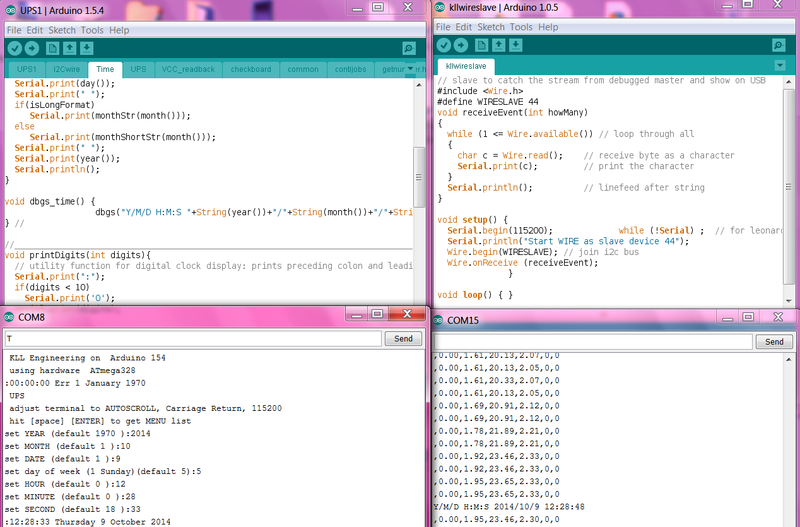 in the V0.1 revision of UPS1 i just try to do the measuring job, in V0.2 send it to I2C debug. 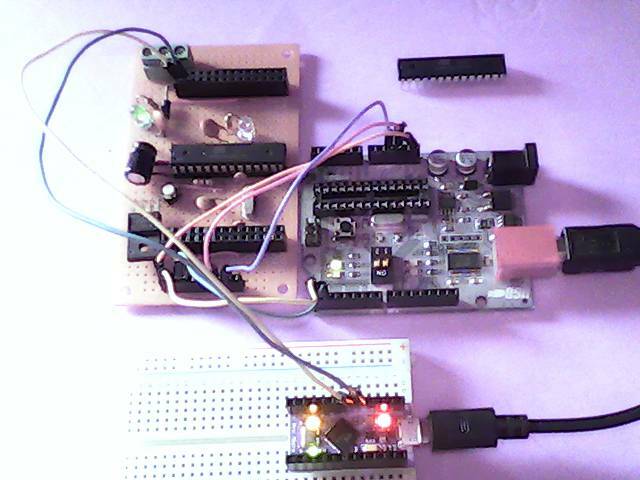 _p2_ then remove cpu, connect DIY_duino ( for FTDI and power ), download, connect debug MICRO. _p3_ and set Time, but as no RTC hardware connected, with limited use. for the often needed board pin info, i copy the internet info to a public dropbox folder, thanks to all the contributors. 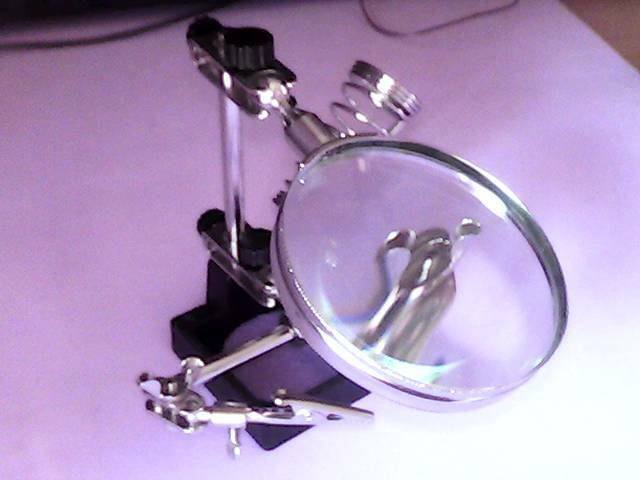 for the SCHOTTKY RECTIFIER diode i got a 40L15 means max 15V , 2 times 20A for 40 THB.